Mike and Blake got away early Friday. On the drive down to the Herrin Compound they talked about Blake’s goal for the motorcycle races would be just to finish them. They were pretty sure Blake was in the lead for points for the 2016-17 Frostbite Series so, there was no need to take any risks. Blake was able to visit with friends and get a good nights sleep at the track. 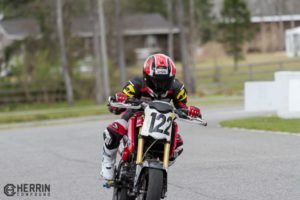 Saturday was practice day and Blake rode his KTM65 and Honda Grom motorcycles for a bit but wanted to ride the Honda 100 more. He knew Jared Trees was going to be his competition and wanted to be ready for him. At one point during practice he tucked the front, a bracket grabbed his leathers and drug him down the track a bit. 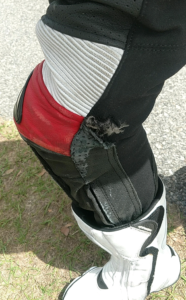 Both his helmet and leathers got scuffed but his body did not. 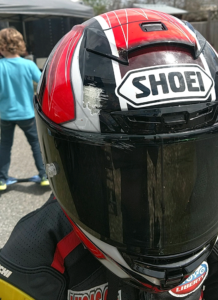 Thank goodness for that Shoei helmet and those Taichi leathers! He picked up the bike, had some help from a friend, Heather Szymanik, to get it started and planned on making a couple of laps (his rule whenever he wrecks) before going in to check everything out. Meanwhile Trees came out on the track for some practice laps and Blake ran with him forgetting all about coming in for a break. 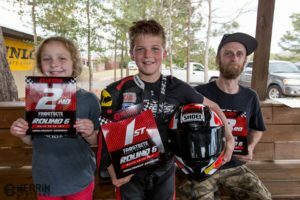 Sunday morning was qualifying and Blake did well he qualified somewhere in the top 4 spots for all of the motorcycle races. After lunch the racing started. The Grom class was first. Benjamin Brewin was out front and Kayala Yaakov and Blake battled the whole time. On one lap, as Blake was coming out of the Ess’s his back end got sideways, his feet came off the pegs and his rear tire was screeching. Reminding him that he was supposed to just be finishing the races and not pushing too hard. He ended up finishing in 3rd place. In Formula 3 Advanced he was back on the Grom. He got pushed to the outside on the start and lost several positions. He worked his way back up to 6th right behind Mike Trautner he would get up close through the tight areas of the track and on the brakes but couldn’t find a safe way around him and then Mike would pull a gap again on the straights. Blake never did get around him; finishing 6th. Finally, it was time for the Stock 100 Advanced motorcycle race Blake had been looking forward to. He was 3rd off the line behind Gavin Anthony and Jared Trees. Blake was able to out brake Trees on the outside of the hair pin going into the back sweeper. His times were consistently faster but couldn’t catch Anthony; he finished in 2nd place. Blake was going to have two races on the KTM 65 back to back. So, Mike brought fuel for the motorcycles and water for Blake onto hot pit. First, was the Middle Weight Advanced class. Yaakov got the hole shot with Blake and Brewin behind her. After lap 1 Blake was going for the pass into turn 4 and Yaakov wasn’t letting him so he had to make room on the inside of her. After that, he put his head down and checked out hitting a lap time of 41 flat; winning the race! Blake came onto pit lane to take a swallow of water and get some fuel for his KTM65 motorcycle, then back out on the grid for the SuperMini race. This class is mostly Honda 150R’s but Blake was able to qualify 2nd. He had a good start but had nothing on those 150R’s he was 3rd into turn 1. Gavin Anthony pulled a gap in front of Blake and Kayla Yaakov. Blake could never get around Yaakov even running a half a second slower than the race before; so he came in third. 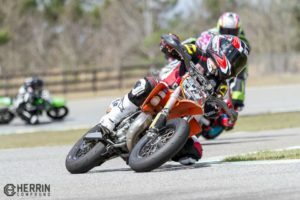 Next weekend the Herrin Compound is having an open track day AND doing awards for the Frostbite Series. So, to Georgia we will go…again! Can’t wait! Come check out the fun!